Thermodynamics – It is a branch of science and physics which is associated with heat and temperature and describes their relation with energy and work. The principle of thermodynamics are very general and give a relation between heat and various forms of energy such as electrical, chemical, optical etc. Thermal equilibrium – Two systems are said to be equilibrium with each other, if they have the same temperature. Entropy – This thermal property of the body which remains constant during an adiabatic process when no heat energy is supplied to or extracted from the body is known as entropy. 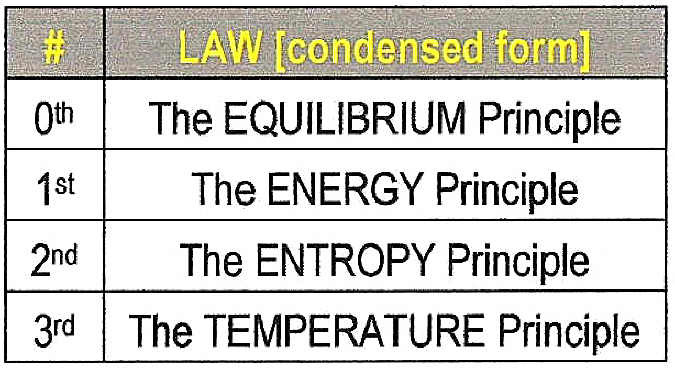 Zeroth law of thermodynamics – It states that if first and second systems are in thermal equilibrium with a third system, then first and second system must be in thermal equilibrium with each other. First law of thermodynamics – According to the first law of thermodynamics, the energy can neither be created nor it can be destroyed but can change from one form into another. Kelvin’s statement of the second law of thermodynamics – It states that to derive a continuous supply of work by cooling a body to a temperature lower than that of the coldest of its surroundings. Clausius statement of the second law of thermodynamics – It is impossible for a self-acting machine unaided by an external agency to transfer heat from a body at lower temperature to another at higher temperature. Third law of thermodynamics – According to third law of thermodynamics, the entropy of a perfect crystal at absolute zero is exactly equal to zero. Wow / such a hard concept to grasp!